We really enjoyed your seminars at the FMCA Convention -- very informative! The gas oven in our motorhome just quit working. We have an Amana range/oven in a Winnebago. The burners on the range still work great, and I can light the pilot light in the oven. However, when I turn up the temperature control knob to set the oven temperature, nothing happens. The pilot light remains on but it seems that no larger volume of gas comes into the burner. Any ideas of what we might check? Thanks in advance! Linda N.
Linda, usually when the thermostat calls for heat, a signal is sent to a component called the oven safety valve. The safety valve allows the gas to flow to the oven burner. The signal however, is triggered by the thermostat. 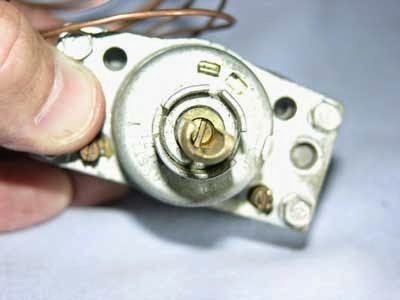 If the pilot flame does not get larger when the thermostat calls for heat, the faulty component is usually the thermostat. If the pilot flame indeed get larger and the main oven burner still fails to ignite, the faulty component is usually the safety valve. If you send me the complete Amana model number I can look up more specific information for you, but right now, I’d have that oven thermostat checked by a certified RV technician, as well as the delivery line gas pressure. The appliances must be fed the correct amount of propane at the correct pressure and that is determined by the pressure regulator down at the propane container. Of course, physical damage such as a kinked tube can also restrict fuel flow and negate burner ignition, but I’m assuming there is no kinked tubing anywhere in the oven system. Time to call the professional!